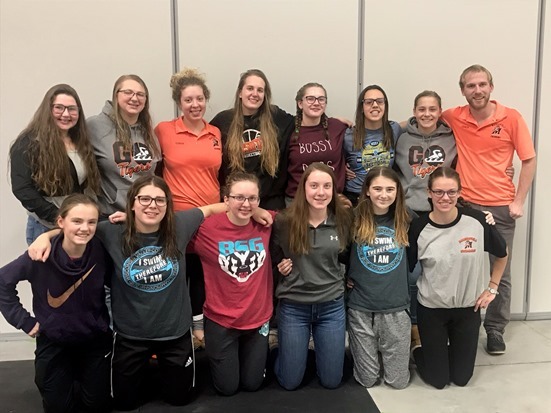 WISCONSIN RAPIDS – The Marshfield girls swim team had three individual top-10 finishes as it wrapped up its season at the WIAA Division 1 sectional on Saturday at Lincoln High School. Alyssa Franks had Marshfield’s lone top-five performance as she was fifth in the 500-yard freestyle in 5:30.84. Kaitlin Alberts had the other two top 10s for the Tigers, taking eighth in the 100 backstroke in 1:04.66 and 10th in the 200 individual medley in 2:26.82. Hope Risa was 11th in the 200 freestyle in 2:06.27 for Marshfield. Marshfield’s top relay performance came in the 400 freestyle as the team of Risa, Tara Kracht, Alberts and Franks was seventh in 4:01.63. Winners of each event, and the next 18 fastest times in each event encompassing all six sectionals, qualify for the 2018 WIAA State Girls Swim Meet on Nov. 10 at the University of Wisconsin Natatorium in Madison. Team scores: 1. Stevens Point 398; 2. D.C. Everest 336.5; 3. Hudson 325; 4. Eau Claire Memorial 290.5; 5. Chippewa Falls/McDonell 189; 6. La Crosse Logan/Central 160.5; 7. Wisconsin Rapids 139; 8. Onalaska/Holmen/Aquinas 123; 9. Superior 102; 10. Marshfield 100.5; 11. Eau Claire North 53; 12. Wausau West 45; 13. Sparta/Tomah 16. Diving: 1. Gretchen Hanson (ECM) 411.80. 200 medley relay: 1. Stevens Point (Kennedy Gilbertson, Alaina Breitbach, Anna Vandehey, Alli Scharbarth) 1:45.32; 9. Marshfield (Kaitlin Alberts, Tara Kracht, Alyssa Franks, Hope Risa) 2:00.25. 200 freestyle: 1. Bethany Rahn (DC) 1:53.66; 11. Risa (MAR) 2:06.27; 13. Franks (MAR) 2:07.05; 27. Maggie Stangl (MAR) 2:35.06. 200 IM: 1. Breitbach (SP) 2:08.52; 10. Alberts (MAR) 2:26.82. 50 freestyle: 1. Casey Summers (SP) 24.33; 28. Sarah Minten (MAR) 30.21; 29. MaryAnn Stangl (MAR) 32.11. 100 butterfly: 1. Vandehey (SP) 56.89. 100 freestyle: 1. Gilbertson (SP) 52.01; 11. Risa (MAR) 58.46; 16. Kracht (MAR) 59.54; 32. Minten (MAR) 1:08.18; 34. Mar. Stangl (MAR) 1:11.60. 500 freestyle: 1. Rahn (DC) 5:05.87; 5. Franks (MAR) 5:30.84; 25. Mag. Stangl (MAR) 6:51.62. 200 freestyle relay: 1. Stevens Point (Vandehey, Sophie Emerson, Sydney Hoff, Summers) 1:38.09; 12. Marshfield (Mar. Stangl, Mag. Stangl, Minten, Emily Hopperdietzel) 2:03.97. 100 backstroke: 1. Gilbertson (SP) 55.49; 8. Alberts (MAR) 1:04.66; 21. Hopperdietzel (MAR) 1:18.94; 22. Allie Bacholl (MAR) 1:21.55. 100 breaststroke: 1. Ella Stein (HUD) 1:05.17; 19. Kracht (MAR) 1:19.34. 400 freestyle relay: 1. Stevens Point (Vandehey, Summers, Breitbach, Gilbertson) 3:33.16; 7. Marshfield (Risa, Kracht, Alberts, Franks) 4:01.63.